Below are the answers to the antiques trivia questions that have appeared in the column to the left. Latest Trivia Answer: What was Annie Oakley's real name? A type of glass invented by Louis C. Tiffany and used in making his lamps. The first glass Christmas ornament. A filler used in restoring furniture. Who was Charles Lock Easklake? The author of Hints on Household Taste, the book that revolutionized American interior design. Why did people use chocolate pots? To serve hot chocolate, a favorite drink among Victorians in winter. Thomas Chippendale was an English designer who worked in England. American furniture craftsmen copied his designs in the late 18th Century. What is a solar lamp? A new type of gas lamp technology that appeared in the 1840s. The brass disc on the end of a clock pendulum. An ornate Rococo framing motif. What is a rosette? A circular floral design. Who is William Morris? The founder of the English Arts and Crafts Movement. Who is P.T. Barnum? An American showman who said "there's a sucker born every minute." What is a show globe? A water-filled glass globe used by pharmacists to signal a disease outbreak. Where did the Hoosier get its name? From the State of Indiana, the Hoosier State, because most of the manufacturers had factories there. Who produced the first picture postcard? The British in 1870. What style of furniture did the Pilgrims use? Jacobean. Where did the term "Yankee Doodle" come from? The Massachusetts Indians called the early English colonists "Yankees," and "Doodle" referred to someone who was a jack of all trades. What is goofus glass? Glass with handpainted decoration. What is a verge escapement? A verge escapement is the mechanism in a mechanical clock that controls its rate by allowing the gear train to advance at regular intervals or “tics.” It's what makes a clock tic. Where did Art Deco originate? Art Deco debuted at the International Exhibition of Modern and Industrial Decorative Arts in Paris in 1925. Samuel Allen, creator of the Flexible Flyer sled, graduated from: Samuel Allen graduated from Westtown School, a Quaker School in Chester County, Pennsylvania. Where did the idea of "Early Americana" get its start? The Philadelphia Centennial Exposition in 1876. What highway did people call the "Mother Road?" U.S. Route 66.
are sold on this site. Have you ever bought an antique or collectible that was less than perfect and needed some TLC? 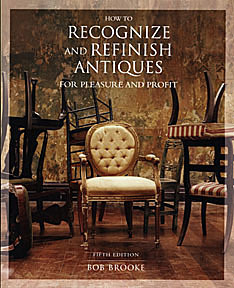 Bob's new book offers tips and step-by- step instructions for simple maintenance and restoration of common antiques. Get up to the minute news of antiques auctions around the country and the world. Read breaking news stories from the world of antiques and collectibles. Search for art exhibitions in museums and galleries around the world.